Setbacks during the last 15 years have occurred only in 2011 (operating profits down 37%) and 2000 (operating profits down 80%, dividend down 50%). Progress otherwise has been up and up. Something to note: Not a single exceptional item has been declared during the last 15 years! The last 15 years have seen total acquisition spend of just £7m. The latest balance sheet displays share capital of £0.7m versus earnings retained by the business of £77m. GDWN generally operates with modest net debt — at the last count cash was £7m while borrowings were £22m. The loans do not seem problematic to me with 2014 profits at £25m. The books also show land and buildings at £21m, which are carried at cost. Given the age of this business, I suspect the current market value of these sites could be substantially more than their accounting value. Another major plus-point for this venerable operator is the absence of any defined-benefit pension obligations. The last five years have witnessed some £41m of cash capital expenditure versus an aggregate £18m depreciation and amortisation charge. Furthermore, aggregate cash of £18m has been diverted into working-capital requirements. These are material sums when total operating profits for the period were £82m. All told, it looks as if GDWN has converted about half of its operating profit into free cash since 2010. Generally that’s a poor conversion… unless it’s clear the reinvested money has been put to good use. Thankfully that’s the case at GDWN — profits have nearly doubled in the same time. The 2014 annual report admits further significant cash investment will be required to support future growth. So I dare say GDWN’s payout ratio — the proportion of profits distributed as a dividend — will remain low at less than 25%. Margins at the larger Mechanical Engineering division reached an attractive 19% during 2013 and 2014. For what it is worth, GDWN claims this division is “world renowned for and the market leader in the design, manufacture and supply of Dual Plate Check Valves for use in the world`s hydrocarbon, energy and process industries”. Return on average equity for 2014 was £19m/£66m = 29% excluding non-controlling interests. Incredibly, the same calculation has topped 20% every year bar 2011 since 2005. John Goodwin and Richard Goodwin have served as executive chairman and managing director respectively since 1992, and have therefore overseen the outstanding track record above. Succession plans seem to be in place, too, with three younger members of the Goodwin family also present as board executives. Does the business employ good-value-for money executives? 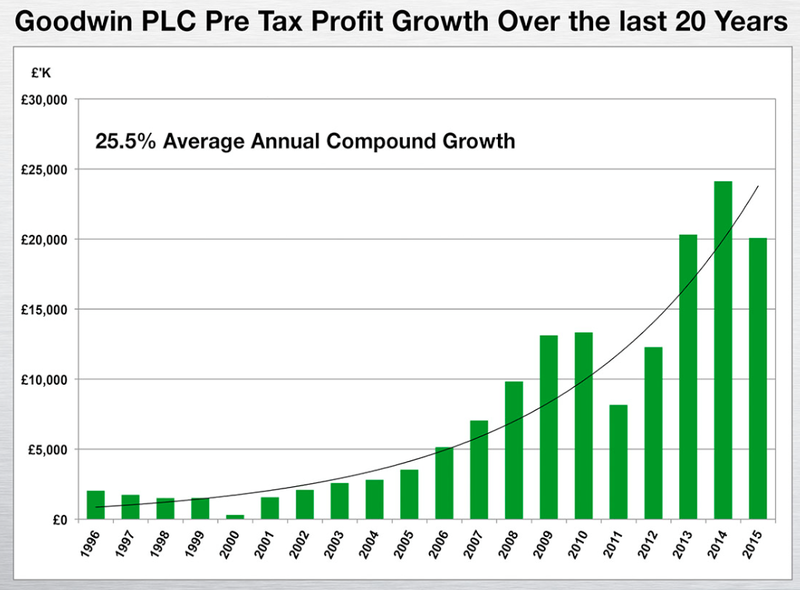 Both John and Richard Goodwin have seen their basic pay rise by an average of 8% a year since 2000 to £308k — which seems very fair to me given how pre-tax profits have surged to £25m. There have been no bonuses to speak of and minimal pension contributions as well. 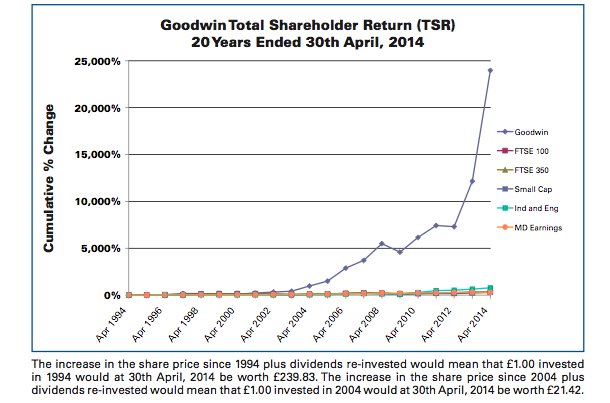 The Goodwin family still control at least 53% of the business — a shareholding presently worth at least £107m. The size of the stake has reduced only slightly I believe during the last decade or so. I also like the lack of any option scheme and how the share count has remained static since at least 2000. “Whilst the energy mix is changing over the long term, it is considered that fossil fuels will likely remain the dominant energy resource in the future and hold 80% of the energy mix by 2035. Crude oil, natural gas (including shale gas) and coal we think will be evenly split in the energy market and it is unlikely by then that there will be any dominant energy form. GDWN’s enterprise value at £28 a share is its £202m market cap less its cash of £7m plus its debt of £22m… that is, £217m or £30 a share. Reported earnings for the year to October 2014 were 275p per share, which when interest costs are excluded come to about 282p. The trailing P/E on my EV and EPS calculations is therefore £30/282p = 10.6. That multiple does not look expensive to me. However, profits are set to drop and the experienced management does not foresee any rebound for at least 18 months. GDWN’s bumper profits from 2013 and 2014 turn out to be ‘freak’ results, making the trailing P/E somewhat academic. Looking at GDWN’s valuation another way, if I want to double my money during the next five years, I need the share price to reach £56 assuming the dividend is held at 42p per share. A so-so P/E of 12.5 on that £56 indicates annual earnings would have to advance to 434p per share — up 10% a year on average from the last reported 275p. Such a recovery is possible of course, but positive progress will be back-end loaded during my five-year horizon. GDWN’s offers lots of positives for me — the track record is superb, the managers are top-notch and the reported returns on equity are wonderful. All that matters now I reckon is determining a great entry price. £28 feels reasonable, but I don’t get the feeling it is an obvious bargain. For now, I think it might pay to await a lower price and/or see just far profits do drop. In the meantime, I’ll do more sums. Hi Maynard, Glad to see GDWN has joined your watch list!. I bought fractional ownership in GDWN with the intention of holding for decades providing the fundamentals remain sound. If the company can continue to compound ROIC like it has for the past 20 years the current price seems more than fair value. I think this quote by Charlie Munger sums it up well. I’ve got a number of interesting compounding machines on my watch list and I’ll be in touch shortly with a few more ideas. Thanks for the Goodwin analysis, interesting company, one I know in the Oil and Gas industry, reliable from what I recall. “Goodwin PLC today announces its third quarter Interim Management Statement for the period 1st November 2014 to 31st January 2015. The consolidated, abbreviated and unaudited income statement below for the nine months’ trading ending 31st January 2015 shows revenue of £108.5 million (2014: £103.1 million) and profit before taxation of £17.3 million (2014: £18.0 million). No surprise about the “trading situation“. My sums indicate the Q3 operating profit was £4,101k — the lowest quarterly profit since the 3 months to July 2012 (£3,930k). Since then, every quarter has delivered profits between £5m and £7.3m. Clearly the O&G sector downturn has started to bite and annualising the latest quarter gives yearly operating profits of £16m — versus £24.5m seen during FY2014. I still need to do more work on GDWN’s valuation, but for now I remain on the sidelines. Hopefully profits will fall further, pulling down the share price and creating a super opportunity to buy for a long-term recovery. Hi Maynard, thanks for that detailed review. The only real downside for me is that lack of dividend yield, but if those retained earnings can be deployed at around 20% then that’s fine by me. Will be interesting to see if you end up buying it. Thanks for the feedback. Yes, GDWN does look good value on a trailing profit basis, but I am convinced the next year or so will see lower profits and a share price lower than the £28 I cited in the article. My earlier comment noted GDWN’s Q3 figures and profit reduction, and I do get the impression the sizeable drop-off in the O&G sector could reverberate for some time. I am on the sidelines at present. Oh, I see the price is now £23, so it has paid to wait so far. I genuinely do not have a price in mind right now. Q4 did not appear great. My sums indicate the fourth quarter produced revenues of £18,568k (down 33% from £27,719k last year) and operating profit of £2,768k (down 54% from £6,014k last year). On a half-yearly basis, it looks as if Goodwin is back to where it was during the six months to April 2012, when revenues were £54m and operating profits were close to £7m. Within the accounts, I note capex was substantial at £18m and caused net debt to move from less than £4m to close to £10m (however, the year-end figure was less than the £15m seen at the half-year stage). The original Blog post above referred to GDWN’s admission that “further significant cash investment will be required to support future growth“. From a preliminary skim, I could not see any worrying movements elsewhere in the numbers. The share price does not seem like an obvious bargain at £26. Enterprise value (EV) is about £27/share and divided by 2015 EPS of 208p gives a P/E of 13. Dilemma is of course is whether the bumper first half (EPS of 141p) or the challenging second half (EPS of 67p) is more likely to occur during the next few years, what with the oil price remaining at recent lows and subdued industry activity likely for the foreseeable future. I am still on the sidelines. Looks like GDWN has finally found someone that could add “significant value“.